to find all the kids and goats dead, bloodless. from the Main Street lamp posts. Mary Christine Delea’s first book is The Skeleton Holding Up the Sky (Main Street Rag Press, 2006). She has two chapbooks, and her poems have appeared in A Gathering of the Tribes, Coal City Review, Freshwater, and Plum Biscuit. She lives in a Portland, Oregon suburb with her husband and six cats and has held various positions, including university professor, social worker and retail manager. 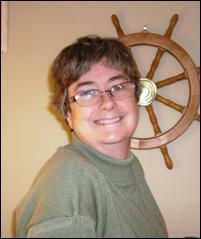 She is currently an at-home writer, quilter and quilt designer.